In the unfortunate event you find yourself involved in a probate estate dispute, it helps to have an understanding of what goes into these issues as well as an experienced attorney on your side. Probate litigation can consist of any number of disputes involving issues relating to disability, aging, death, the discovery of assets, determination of heirs, validity of a will, and the disbursement of estate assets. Whether the dispute involves litigation over those still living, legal disputes covering joint bank accounts, powers of attorney, beneficiary designations, living wills or legal challenges related to wills, estates and trusts after someone has passed on, probate estate disputes touch on a variety of different areas of law. That’s why it is important to use the services of an attorney with experience in many areas of probate litigation. Additionally, you want an attorney with courtroom experience. While there is nothing wrong with it, many lawyers simply draft wills and other estate planning documents. At Murphy, Taylor, Siemens & Elliott P.C., we can do all of that in addition to litigating probate cases in court. WHY CHOOSE MURPHY, TAYLOR, SIEMENS & ELLIOTT P.C.? We Truly Care About Our Clients. With so many cases coming through our doors, our clients are often quite surprised at the amount of personal attention they receive from our attorneys. At Murphy, Taylor, Siemens & Elliott P.C., we believe every case is important and take the time to get to know our clients. In every probate estate dispute, we want to hear your story. We are Experienced. 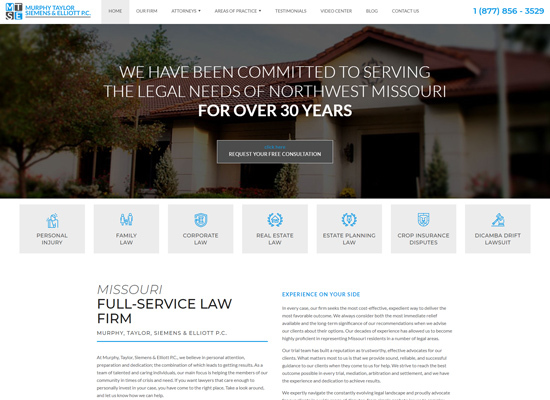 As a law firm, we have been operating together since 2002. As individual attorneys, we have more than 100 years of combined courtroom experience. As a client of ours, you will benefit greatly from the knowledge and experience we have in front of judges and juries. We Aren’t Afraid. Many law firms prefer to keep their suits clean and pressed, but we aren’t afraid to get dirty tackling the tough cases. The more difficult your case, the more we want to help. We are Committed to our Community. In addition to providing high-quality legal assistance, we are dedicated to making our community a better place. That’s because we live, work and play here and want to make sure our families are safe and sound. Look around and you will find that all of our lawyers are active members of our community and make it a priority to hold others accountable for the decisions they make. At Murphy, Taylor, Siemens & Elliott P.C., we are more than a law firm. We are a group of individuals unified by the desire to help people pursue justice in an honest and trustworthy manner. If you believe you have been wronged in any way, contact us today at (816) 364-6677 to learn about the legal steps you can take. We don’t believe any case is too small, large, easy or difficult to tackle and will tirelessly work on your behalf.